Our therapists offer a free 15-minute consultation by phone or in person. We can address issues such as, depression and anxiety, post-traumatic stress, communication and conflict resolution, anger management, recovery from abuse, relationship issues for couples and families or problems adjusting to life changes such as the death of a loved one, divorce, the loss of a job, relationship or pet. Please contact us at (608)-244-4859. Our out-of-pocket rates are subject to a sliding-fee scale in the event of financial hardship. Please have this discussion with your therapist when requesting services. Please call (608)-244-4859 to inquire. We require a 48-hour notice for canceled or rescheduled appointments. If you cancel within the 48-hour time frame, you will be subjected to a $75 fee. If you fail to call or contact the clinic, you will be subjected to a $100 fee. NOTE: We are unable to accept Badgercare Plus, such as Badgercare with Quartz HMO. If you have an HMO associated with your Medicaid plan, such as Dean, GHC or Quartz, we are unable to accept your insurance. Questions? Call us at 608-244-4859. Do you struggle with obstacles that keep you from eating better, moving more and making your health a priority? Do you struggle to adopt the lifestyle you need to fend off preventable disease, live longer and spend less on health care? If you find yourself living in a vicious cycle of temporary change fueled by quick-fix solutions, your achievements may be short-lived. Let us help you end that vicious cycle. Maureen is a certified personal trainer by the American Council on Exercise, and she has the fitness, nutrition and behavior-change coaching skills you need to empower you to positive, long-term healthy change. 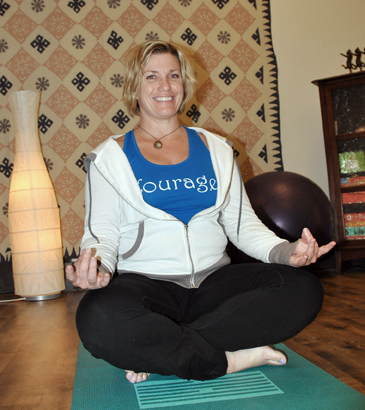 If you’re looking yoga therapy, Maureen will meet with you to assess your needs from a holistic perspective. What works for you physically, emotionally, mentally? She can design a program to help you facilitate sustainable change that leads to weight loss, healthy eating, regular physical activity and overall well-being. Contact Maureen at maureen@insightmadison.com. Visit our yoga studio’s webpage for more information on our group classes. The American Dance Therapy Association, founded in 1966, defines dance/movement therapy (DMT) as the “psychotherapeutic use of movement to further the emotional, cognitive, physical and social integration of the individual” (adta.org). Research shows that movement can open nerve pathways between the brain and body and impact growth and development during all life stages. Dance/movement therapy is a unique form of psychotherapy that is founded on strengthening this body-mind connection. Individualized therapy provided by a board certified dance/movement therapist who also has a license in professional counseling. Dance/movement therapist is adapted for all ages, sexes and mental and physical abilities. Healing of the whole person by incorporating movement, creative process, and verbal communication. Gain access to emotions and issues that might be hard to talk about in verbal therapy. Learn to use movement as a means for self-expression, insight, and behavioral change. Dialectical behavior therapy (DBT) can provide new skills to manage emotions and improve relationships. We are currently working on adding group sessions utilizing DBT. Stay tuned for more information. Somatic expressive therapy (SET) recognizes the body as fundamental to healing. SET uses the expressive arts — including movement, writing and drawing — to help clients better understand their healing process. A combination of the following tailored to each individual: Stretching, Yoga, Qigong, dance, drawing, writing, relaxation exercises, mindfulness exercises, body-awareness exercises, and visualization. SET can help in many ways including increased relaxation, motivation and insight; lower stress, depression and anxiety symptoms; and it can encourage emotional regulation.